Views of majestic Mount Mansfield. Red, yellow, and orange. Cool days, cooler nights. Cozy sweaters, fuzzy socks. Pumpkins and scarecrows. All the things we love about fall. The views of fall foliage in Vermont with the backdrop of Mount Mansfield are like no other! Mountainous terrain and endless forests produce an enchanting blend of reds, yellows, and oranges. The perfect place to enjoy fall foliage, that happens to be a few short miles from Sterling Ridge Resort, is Smugglers Notch Pass. This one-of-a-kind, winding Vermont road through Mount Mansfield, takes you through a sea of autumn trees. You can even stop along the “Notch” to hike one of the many great trails that allow you to see fall foliage from new heights. One of our favorites is the Long Trail – Sterling Pond. The Long Trail is the oldest long-distance hiking trail in the country, and trail access in The Notch is located across from the parking area. The hike to the top of Sterling Mountain itself will take you about two hours to complete – totally worth the time and the effort! In the Jeffersonville, Vermont area there are plenty of other ways to experience the colors of fall (one of which is bound to fit your style). Including horseback riding at Lajoie Valley Stables, Percy Farm Corn Maze in Stowe, apple picking at one of many local orchards, and simply enjoying the views of Mount Mansfield at Sterling Ridge, and the colorful trees around the pond and from your cabin in the woods! 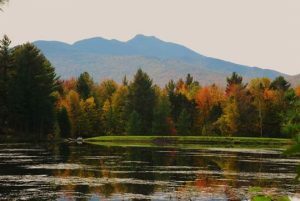 If you are looking to get the true Fall experience at the foot of Mount Mansfield, come to Vermont! We promise the views won’t disappoint!